All eyes will be on the Octagon Saturday night when former UFC middleweight king Anderson Silva looks to reclaim his throne against champion Chris Weidman. However, there will be one set of eyeballs sitting front and center with a true vested interest in what goes down at UFC 168. During Thursday’s pre-fight press conference, UFC president Dana White promised former top contender Vitor Belfort (pictured) will fight the winner of the biggest rematch in mixed martial arts history. 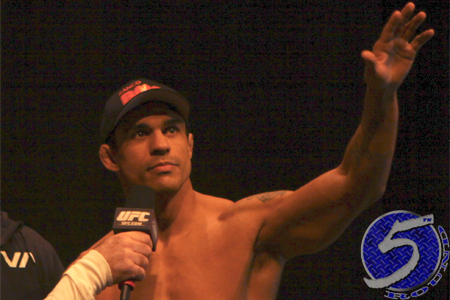 It was welcomed news for Belfort, who has been aggressively campaigning for a title shot all the livelong day. “The Phenom” has posted three straight wins via knockout, with his most recent coming in a light heavyweight affair against Dan Henderson. His last trio of bouts have taken place in his homeland of Brazil. While Belfort is pleased to just get another crack at the crown, it is believed he would prefer for Silva to reclaim his title and challenge “The Spider.” Let’s not forget, Belfort is on the wrong end of one of the most replayed highlights in MMA history when Silva unleashed a Steven Seagal-inspired front kick to his face at UFC 126 in February 2011. Belfort has yet to meet Weidman. According to the Gambling Gods, Silva is a slight -170 odds-on favorite beat Weidman this Saturday. UFC 168 takes place inside MGM Grand Garden Arena in Las Vegas, Nevada.